don't let pigmentation, dark spots and uneven skin tone bring you down! 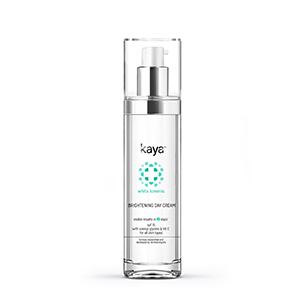 Kaya Pigmentation Reducing Complex is a unique formula which combats skin troubles and helps you achieve the flawless skin always dreamt of! Phytic acid which is proven tyrosinase inhibitor. Fast-absorbing night cream for resistant spots, tanning & pigmentation marks. 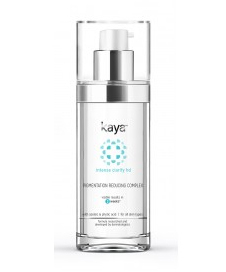 Formulated with highly potent actives like Azelaic acid and Phytic acid which are proven tyrosinase inhibitors. Pigmentation is simply the presence of dark (hyperactive pigmentation) or light (hypo pigmentation) patches on the skin. This condition is common and may present in a variety of forms. Pigmentation, especially on the face and exposed areas can affect the overall emotional well being and self-esteem of the individual. You get your skin colour from a pigment called melanin, which essentially protects you from the damaging effects of the sun. Excessive exposure to the sun causes this pigment to be produced more. An increase in the activity or production of this melanin can cause an uneven ?freckly? appearance on the surface of the skin. These areas of hyper-pigmentation are called lentigens and are commonly referred to as age spots. What factors contribute to Hyper-pigmentation? Pregnancy & Birth Control: Hormonal changes during pregnancy and the use of birth control pills may also cause hyper-pigmentation in some cases. Dark Patches on the skin are incurable -As mentioned above, melasma or other patches can be treated, but in some cases, they do recur. It has, therefore, important to continue to treat them consistently. Sunscreen is needed only when you have an outdoor event/ job-It is the most common of myths and untrue. It is importance to use sunscreen even when you are at home during daytime. Sunrays can inflict permanent damage on your skin and when it comes to pigmentation, exposure can be the root cause. Children inherit pigmentation from their parents-Not always true. Some types of pigmentation can be inherited or have a genetic basis but most of them are acquired through inflammation. Hugh-end laser treatments and peels will cure pigmentation-While some kinds of pigmentation, such as acne-induced pigmentation or DPNs, can be cured completely, many forms can only be significantly lightened.